It begins with Eric (Guy Pearce) in his parked car in the middle of seemingly no where, hesitating. He stares straight in deep thoughts for about 20 seconds while a fly flying around his face, then he gets out of his car and goes into a dodgy-looking Asian house-bar in the middle of a desert for a drink of water. We’d gradually understand and accept that this is in a dystopian future in Australia, 10 years after global economic collapse, without the film ever explaining what actually caused it. His car gets stolen by three robbers that seemingly has no intention of taking anyone’s life. Eric, for some reason, is desperate to hunt down these robbers and get his car back. 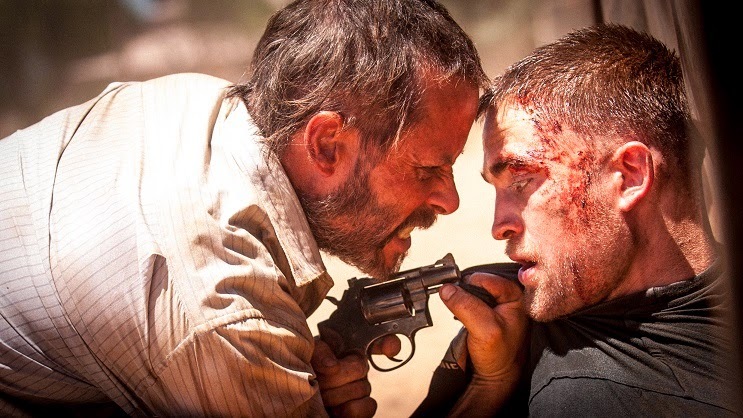 While tracking down his vehicle, he bumps into an injured accomplice of the robbers, Rey (Robert Pattinson), and forces him to take him to where his friends are at… but it’s not nearby. 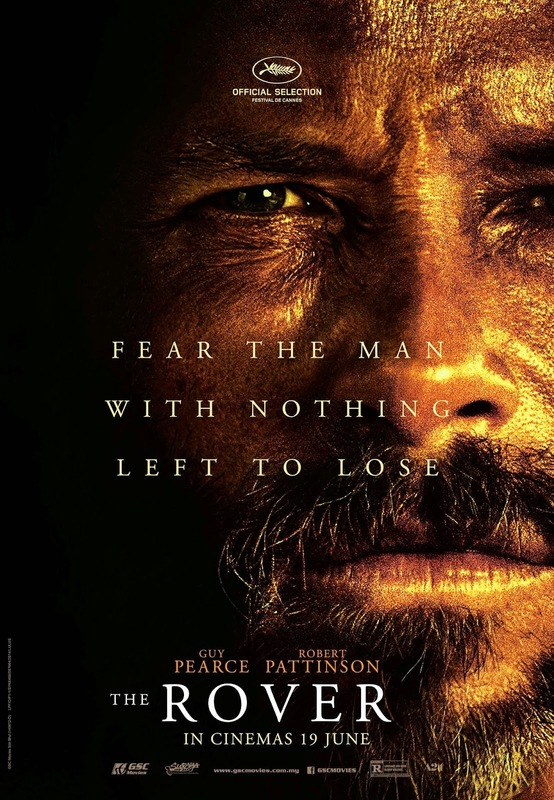 Great performance by both Pearce and Pattinson. It doesn’t look like Pearce, or sound like him here, and his display as the angry broken man Eric, with little to say but a lot to express, is just engaging and compelling as it keeps audience to want to know who he is and why the hell does he want back his car so much. The former Twilight star Pattinson has shown that he has way better quality than that “saga” in his other films, and here he continues, playing a completely different kind of role, an offbeat character to be exact and who would’ve known he could do it? His role as the young Rey is a slow-talking, easily nervous, half-wit character. Both these main characters slowly begin to have an unlikely father-and-son-like relationship, though the very-slow conversations do feel close to Brokeback Mountain (2005) if you know what I mean. Every scene is considerably beautifully shot but it’s very slow-moving as well. You get my point yet? The movie is so darn slooooooow, but forgivable for keeping me intrigued and curious about these engaging characters. Awkwardly, although The Rover is in constantly serious tone, it does have some surprisingly random funny moments, for example, throughout the movie we hear scores by Antony Partos and instrumental stuffs like Djed and Four Day Interval by Tortoise, but there’s a scene where the characters are walking through the desert, Keri Hilson’s pop song Pretty Girl Rock starts playing in the background. Everyone in the cinema hall thought that there’s something wrong with the audio… until Rey starts singing to it in the scene. Well played, David Michod (Animal Kingdom), who, by the way, is the writer and director of this film. Most of the dialogues are not only too slow, but vague as well, and practically pointless if not for the sake of developing these two characters. And no, Rey’s line “not everything has to be about something” is not an excuse for this, I refuse to accept it. However, while it’s not explained how the major economic downfall happened and what led to this post-apocalyptic world where everyone looks dirty living in the desert, Michod’s intentions are clear. The narratives seek to explore the morality in this world where these’s no real consequences for anything you do. And since there’s no governance, no plants, no money, no nothing, are there really such things as bad guys when everyone’s just doing what they can to survive without really intending to kill anyone? Censorship in Malaysia: Vulgarity and most of the violent scenes are intact, but there was a scene at the beginning that was abruptly skipped to the next one, and I’m not sure what it was about. Second opinion: My girlfriend said she had no idea the hell is going on in the movie, and that it’s hard to pay full attention to it. Verdict: Oh so slow, but oh so watchable. The general audience would definitely, definitely, hate it.